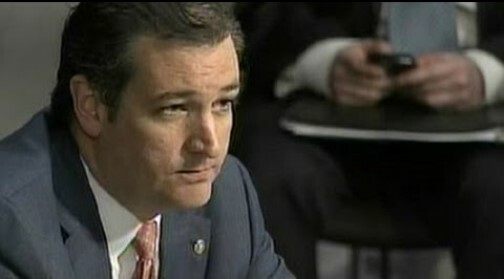 During yesterday’s Senate Committee on the Judiciary hearing regarding the Administration’s failure to enforce immigration law against criminal illegal aliens Senator Ted Cruz led the fight for justice for the families and the victims of the illegal alien crime wave sweeping America that has been not just allowed, but created by federal policy during the Barack Obama presidency. Cruz further interrogated the ICE Director in a contentious exchange our friend Jason Howerton of Glenn Beck's The Blaze brought to our attention. “There are too many politicians in Washington that talk a good game but don’t act. If you want to honor Josh [Wilkerson], if you want to honor Kate Steinle, start enforcing the law and stop releasing murderers, and rapists, and drunk drivers. I don’t want to hear from the Obama Administration they're sorry while they continue to do the exact same thing because what we know – more people will be murdered, more people will be raped, more people will be killed by drunk drivers because this Administration refuses to enforce the law. That is wrong. No man is above the law, and that includes President Obama.” Sen. Cruz said. “Kate’s Law”, the Establishing Mandatory Minimums for Illegal Reentry Act of 2015 was introduced by Senator Ted Cruz as a companion to legislation introduced in the U.S. House of Representatives by Rep. Matt Salmon of Arizona. The bill would amend federal law to impose a mandatory minimum sentence of five years for any illegal reentry offense. The bill is named for Kate Steinle, the 32-year-old woman who tragically died in the arms of her father on a San Francisco pier after being shot by an illegal alien who had several felony convictions and had been deported from the United States five times. You can read the full text of “Kate’s Law” through the link. Submitted by lafritz65 on Wed, 07/22/2015 - 21:39. Withhold SCAAP funding, 'Cops on the Beat' funding, or any other law enforcement DHS grant to jurisdictions that refuse to cooperate with federal immigration agents (sanctuary jurisdictions). Allow states to pass immigration enforcement laws so long as the penalties do not exceed the federal penalties. Require DHS to provide all known data to the National Crime Information Center for aliens who have final removal orders, overstayed or misused a visa, or entered in to a voluntary departure agreement. Provide grants to local jurisdictions that help enforce immigration laws. The Cruz bill is similar to Kate's Law in that it would only imprison previously deported aliens that return to the U.S. It wouldn't require jurisdictions to notify ICE when they release criminal aliens from prison."